War on Earth has rendered its surface uninhabitable for the human race. In order to preserve themselves, humans have moved to the depths of the ocean and established new colonies. However, the humans� fight for survival is threatening the delicate ecosystem which descendants from the lost city of Atlantis have survived within for millennia. Neither side is willing to compromise over the limited underwater resources, so the two factions are gearing up for battle � a battle that will determine which race will thrive and which will become a memory. Blood Tide is a multiplayer-online-action-real-time-strategy-game that allows players to take the role of a tactical Commander or elite field-commander for two different factions. Blood Tide is a multiplayer game which pits two players against each other. Each player will take control of either the Humans or Piscivian faction. Gameplay takes place in two modes: command mode and field mode. 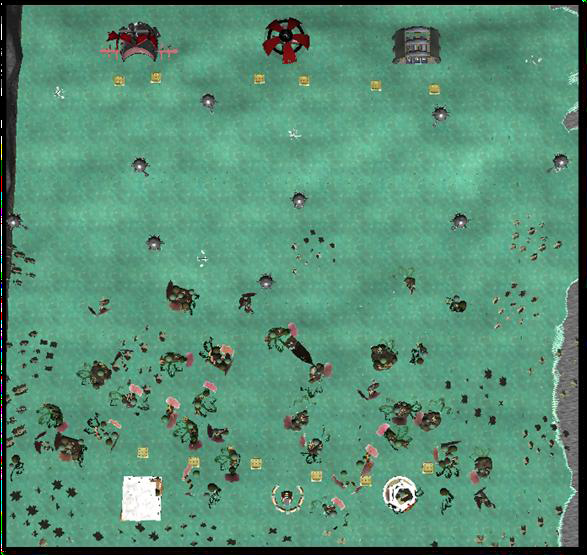 In command mode, the player can control units and construct buildings, like an RTS game. In field mode the player can take the role of the field-commander for a faction. This mode plays like an action game with a third-person chase camera. The player can switch between the two modes to better utilize the functions of the field-commander and commander. At the start of a game session, each faction has three bases. These bases act as spawning points for different types of units that can be further specialized through the building of farms, training grounds, and guard towers. When a faction loses all three of its bases, that player loses the game. Winning a game is determined by how effectively the player can manage units, the strategy employed when upgrading bases, and how well the player controls the field-commander in skirmishes.